Note: I will be updating/adding as I can. Known for their fiery tempers and fierce determination, Dark Iron dwarves have a turbulent history with the other clans. A failed coup in Ironforge ignited the War of the Three Hammers, and many of the Dark Iron once fought in the service of Ragnaros the Firelord. Though one faction is pledged to Queen-Regent Moira Thaurissan, others refuse to stand alongside their kin. The Alliance seeks a united Dark Iron clan to harness the power of Azerite and aid their struggle against the Horde. From the WoW site, Allied Races page and the Preview Article on Dark Iron Dwarves and Mag'har Orcs. Sorcerer-Thane Thaurissan was the leader of the Dark Iron dwarves during the War of the Three Hammers. When he lost Ironforge to the Bronzebeard clan, Thaurissan retreated to the Redridge Mountainss and founded a city in his name. In a desperate attempt to defeat his enemies, Thaurissan accidentally summoned the demigod Ragnaros, which resulted in the sorceror-thane's immediate death and the formation of the volcanic peak of Blackrock Mountain. Currently led by (Queen-Regent) Moira Thaurissan (Moira Thaurissan/Moira Thaurissan) (née Bronzebeard, as she's the daughter of Magni Bronzebeard) (also currently Dark Iron Representative for the Dwarven Council of Three Hammers), widow of Emperor Dagran Thaurissan, and mother to Emperor Dagran Thaurissan's heir, the Dark Iron Dwarf clan hails from Blackrock Mountain, nestled between the Burning Steppes and the Searing Gorge. Their seat of power, Shadowforge City, lies deep within the mountain, and above Molten Core. Previously enslaved to the elemental lord Ragnaros, they find themselves without old leaders, who were hell-bent on conquering Ironforge, and under a regency. Their regent has guided some of them towards Ironforge, to teach their fellow Dwarves their sorcerous ways. You've probably encountered Dark Iron Dwarves before. Whether you decided to Kill 'em With Sleep Deprivation while becoming a member of the Thorium Brotherhood, you got drunk and decided Down With The Dark Iron during Brewfest, you charged into Blackrock Depths and assassinated Princess Moira Bronzebeard's husband, or you really liked Archy and discovered stories of the Kings Under the Mountain, you've most likely previously learned something of these Dwarves. 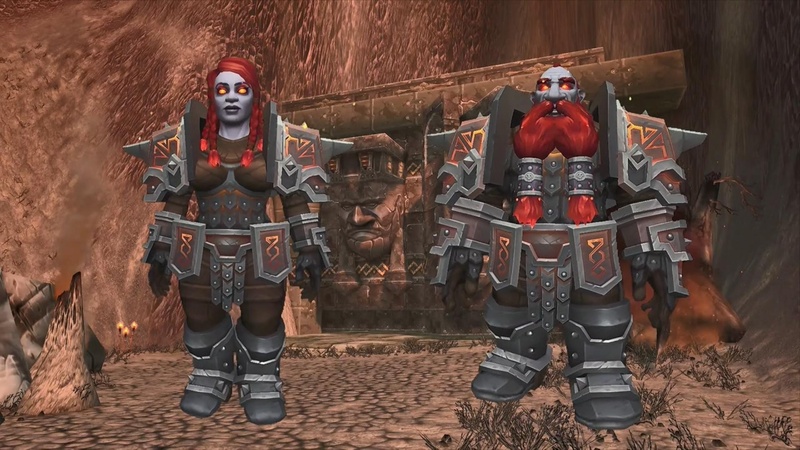 One of the new Allied Races coming in the Battle for Azeroth expansion, the Dark Iron Dwarves have been seen in World of Warcraft since Classic. Note, Allied Races start at level 20, and with the new level scaling from 7.3.5, Dark Iron Dwarves can quest in any zone requiring a 10-60 level range, as long as said zone has Alliance quests. an additional quest chain, requiring 120, starting in the Alliance Embassy in Stormwind City, and ending in Dark Iron Dwarves. This chain involves scenarios and an instance run. Hunter Pet: currently This guy on Character Creation screen, though I suppose this guy could still happen? the Dark Irons had, until recently, been enslaved by the elemental lord of fire, Ragnaros, and pushed inexorably down a path of evil. His dislike for the Dark Iron clan ran deep. Betrayal and treachery seemed as ingrained in the Dark Irons’ culture as gryphons were in that of the Wildhammers. The Dark Irons had recently won respect in Ironforge by playing a major role in fending off a brutal troll invasion, saving a number of dwarves—members of the other clans. Racials: Dark Iron Dwarf racials are Earth/Fire/Engineering/BS-oriented. Fireblood Fireblood - Removes all poison, disease, curse, magic, & bleed effects and increases your primary stat by X for each effect removed. Lasts 8 sec. 2 min CD. Dungeon Delver Dungeon Delver - While indoors, move 4% faster. Forged in Flames Forged in Flames - Reduces damage taken from Physical attacks by 1%. Mass Production Mass Production - Increased BS skill. Items crafted by Blacksmithing are created more quickly. You can view the Female Dark Iron Dwarf and Male Dark Iron Dwarf models in the Modelviewer here on wowhead. Dwarven build mostly in line with current the playable Ironforge Dwarf clan (Bronzebeard). Red, Orange, Black, Grey, or White hair, complete with embers kissing the tips. Bloodthirsty, Paranoid, Cunning, and more than a bit Sneaky. Tinkerers, known for creating Mole Machines for movement and Golems for defense. Adept with Arcane and Fire magics. Adept Blacksmiths, capable of easily manipulating Dark Iron ore. When a character of one of the Allied Races is leveled from 20 to 120, the player gets an Achievement (Heritage of the Dark Iron) and unlocks a set of Heritage armor to use on that race for their account. Lady Dark Iron Dwarf in the Heritage gear in the wowhead Dressing Room! Note: Alt colorations not currently available for player characters. Iron on the streets, volcano in the sheets! I'm a nice girl, but I know my way around an anvil. It takes more than a mug or two to get on my good side. A keg ought to do it! Ye put a gleam in my eye. Well, so does lava but mostly you! If you want to impress me on a date, don't try to pick me up in a mole machine. Come over to my place - we'll iron out your love life. The way you swing that hammer really stokes my forge! I live in a volcano. Personal hygiene...ain't exactly high on my list of priorities. I once had a pet bird. I used to tell him "By fire be perched." Stop, drop, and roll! And just what is that supposed to mean? Some dwarves just wanna watch the world burn. I happen to be one of them. Ah, me ma and da met at the Grim Guzzler. Ha come to think of it, everyone's ma and da met at the Grim Guzzler. Ha I always wanted a pair of diamond earrings. Think Magni would notice if I chipped off a couple of bits? The secret to living a happy life at the Forge? Flame resistance hair nets of course! Things are getting a little heated, don't you think? You make my iron heart feel warm, hot even. Wait, that's just my beard on fire again. Interested in joining the mile deep club? Even Ragnaros didn't burn as hot as my heart for you. Did you come from a diamond mine? 'Cause I want to learn all your facets. I can keep you warm on a cold night. Well at least my forge can. I'm a hunk-a hunk-a burning love. Come here a second. I want to axe you a question. My wife complains I leave soot all over the furniture. I say it adds character! That Magni Bronzebeard thinks he's so clever but I can see right through him. I'm a very passionate fellow. Can ya tell by the fire in me eyes? When a core hound messes on your carpet, ye don't bother with a towel. Ye grab a fire extinguisher. Maybe you want a molten/fiery mount? Confused on Dark Iron styles? Take a walk through BRD, there are many styles present. You can also find Dark Iron Dwarves present in several other zones. Their styles vary, but they tend to stick to darker colors, sometimes muted colors. It's also important to note that these are Dwarves, and Dwarves are notoriously obsessed with alcohol and alcohol-related items. Also important to note that they're Dwarves. Dwarves who live in a mountain and have mastery over certain ores, so you could also use mining-related, and ore-based-profession-related items. Note: Dark Iron Ore must be smelted into Dark Iron Bar at a specific forge in Blackrock Depths. Note the second: Most Dark Iron recipes (e.g. Plans: Blackguard and Plans: Dark Iron Gauntlets) require Thorium Brotherhood. See Lokhtos Darkbargainer in Blackrock Depths for those recipes. Some are drops within the mountain, e.g. Plans: Dark Iron Plate and Plans: Dark Iron Pulverizer. Some are found within objects in BRD, e.g. Plans: Dark Iron Mail and Plans: Dark Iron Shoulders. Maybe you want some player-crafted Dark Iron gear or weapons? Maybe you want some Dark Iron style, but not black&red coloration gear? Maybe you want molten/fiery weapons? Maybe you want molten/fiery gear? Perhaps you find yourself in need of a mug/stein/tankard/bottle/keg? Mok'Morokk's Grog Bottle - obtainable via a Horde quest, but transmogrifiable on allliance, once obtained. Barman Skewer - hopefully this stays transmogrifiable once BfA goes live. Maybe you find yourself in need of Mining/Blacksmithing/Engineering-style weapons and gear? Unfortunately, none of the wrenches, spanners, etc seem to be transmogrifiable at this time. Maybe you want a molten/fiery/smithing/burnt battle pet? Lil' Ragnaros - Store pet, bonus points: stickin it to the man (Rag) by having this pet out. You sassy Dark Iron, you. Mark of Flame enslave those who enslaved you! Maybe you want a more Dwarven/Engineering-themed battle pet?